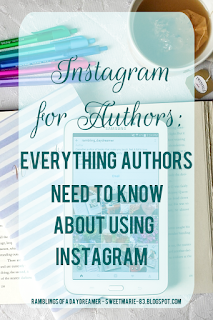 On a weekly basis, I see authors talking about how they want to use Instagram to promote their work and build a fanbase, but they don’t know how or where to start. Well, that’s what I’m here to help you with today! When I first joined Instagram about three years ago, I wanted to post pictures of regular things - what I was doing, what I was watching or reading, my niece and nephews. I figured I would talk about my books occasionally, but I didn’t have any specific goals in mind regarding gaining a following or selling my books through the platform. Then I discovered the Bookstagram community and fell in love with it the way I did with book blogging many years ago. I love being part of the bookish community and getting to talk about books, use my creativity to stage photos, and meet other book-loving people. I began to miss posting regular photos though, and found that on the rare occasion I posted a non-bookish picture, I would lose followers. So I started a new account, where I could post everyday things, plus talk about my writing. 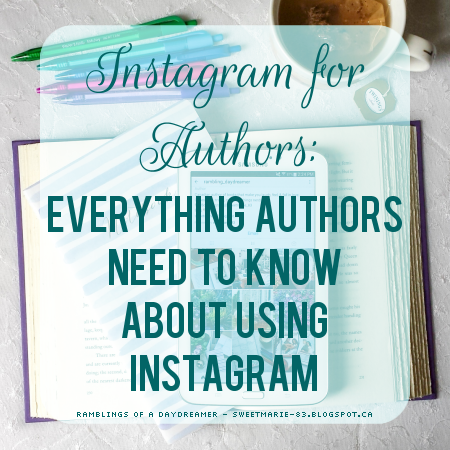 If you’re an author who wants to use Instagram as a promotional tool, the key is showing people you’re a regular person. We all want to make connections online, and many readers want to know the person behind the keyboard. When I finish reading a book I love, one of the first things I do is look up the author on social media. I enjoy seeing what they’re up to, what they’re working on, what their hobbies are, and if we have things in common besides a love for stories. Just as with any other form of social media, nobody likes when someone talks about or promotes themselves constantly. It’s important to have a mix of ‘real life’ posts in with your book-related posts. -Write a great bio. Your Instagram bio is limited to 150 characters, so you have a small amount of space to grab someone’s attention and make them want to stick around. What can people expect from your feed? What type of books do you write? What makes you different? -Have a clear profile picture. A picture of yourself works best; people respond better to photographs than to logos. That being said, not everyone is comfortable with posting pictures of themselves, especially if they’re writing under a pseudonym, so do whatever works for you, as long as you feel it’s a good representation of yourself. -Have a link in your bio to your blog, website, social media you’re most active on, your newsletter, or a site where your books are available. If you have a blog, Instagram can be a great way to drive traffic to your posts; you can share a picture related to your blog post, and tell people about it in the caption, with a reference to the link in your bio (for example, today on Instagram, I’ll be posting the same picture I used in the header graphic of this post and in the caption I’ll mention this article and direct people to the link in my bio). -Related to the link in your bio: Have a call to action directing people to click on the link. For example: ‘Sign up for my newsletter’ or ‘Read my latest blog post’. -Personal account vs business account: I’ve seen many people ask about the benefits of a business account as opposed to a personal one, or say they’ve heard people talk about their likes and engagement decreasing after switching to a business account. 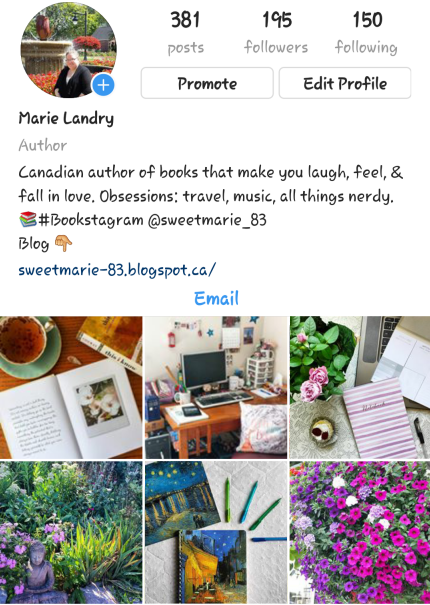 I have a regular account for my Bookstagram and a business one for my author account. To have a business account, first you need to have a Facebook fan page, because it links through that. The greatest benefit of a business account is it allows you to track your stats. You can see the best times to post, your most popular posts, the number of profile views, and number of clicks on the link in your bio, among other things. This is a great way to see at a glance what types of posts work best for you and which ones aren’t so popular. Also, with a business account, people have the option to email you directly from your profile, plus you can run ads (which is something I haven’t tried yet, but plan to with my next release. I’ll keep you all posted on that!). If you switch to a business account and find a decrease in interactions, you can always change back to a regular account. -If you’ve been on Instagram for awhile and want to make the transition to a themed account, you might wonder if you should delete older photos. I say it’s not necessary, but it’s a personal preference. If you were to scroll back in my Bookstagram account, you’d see travel pictures, pics of my niece and nephews, shots of food and sunsets and all kinds of random things. Ditto for my personal account before I started making a concerted effort to ‘theme’ my account. If you do want to start fresh, Instagram now has an ‘Archive’ option where pictures will be gone from your feed, but saved within your account. To do this, click the three vertical dots in the upper right corner of any picture and click on Archive. You might also want to go through and delete selectively - photos that are grainy or have poor lighting, or that you feel don’t fit with the image you want to present. It’s completely up to you. -Your workspace. At a desk? Outside? In a coffee shop? If you work somewhere different every day or every week, this is a great way to mix things up in your Insta feed. -Your view as you write. Out a window? Are you in a library? In the garden? By the pool? -Your favourite tools to use when writing. Laptop or desktop? Paper and pen? -Your writing essentials. Coffee, tea, water? Snacks? -Things that help you stay organized. A planner? Bullet journal? Giant wall or desk calendar? To-do lists? Notebooks? -Do you listen to music while writing? Have specific playlists for your books? Sometimes I think I’m one of the only people left on earth who still buys and listens to CDs, but you can take pictures of CDs, playlists on your computer or phone, or even handwritten playlists. -Who or what keeps you company while you write? Do you have a pet? A child playing nearby? -Is your book set in or based on a real place? Do a ‘tour’ or post pictures that inspired you. -Get comfortable using Photoshop or an online graphic creator/photo editor like Canva or PicMonkey and make teasers for your books. You can also post fan-made teasers (with credit) or teasers you buy from graphic designers. -Do cover reveals for your books. -Need help with something specific? A cover reveal? ARC sign-ups? Blog tour? Make a graphic or take a related picture and ask for help in your caption. Direct people to the link in your bio (for example, if you have a cover reveal coming up, create your sign-up sheet and post that as the link in your bio with a call to action). -Do a countdown to a new publication. Get creative with photos or graphics and start a daily countdown a week or a few days before release day. -Have swag? Take pictures of it and post it. -Share snippets from good reviews. If the reviewer is on Instagram, tag them. -Host a giveaway. You can give away your book(s), swag, gift cards, a favourite book by another author, prize packs (stuff related to your book, snacks, bookish merch like bookmarks, mugs, or pillows, pretty notebooks and pens), etc. -Take a picture of the interior of your book - this works for physical books and ebooks. Do you have beautiful chapter headings? Graphics in your book? Did you write a special, touching, or funny dedication? -Your book out in the wild. If your book is in bookstores or libraries, take a picture of it on the shelf, or you holding it. You can also take your book on excursions and take photos of it in different places - coffee shops, while on vacation, in front of a setting that inspired a scene in your book, etc. -Share readers' pictures. You can download the get_repost or regram app to share photos or take a screenshot and post it. Be sure to tag and thank the photographer! -Promote other authors. Remember how I said no one wants to follow someone who talks about themselves constantly? This is a great way to showcase other authors, whether they’re friends or authors you admire. Talk about the books you love so it’s not all about you all the time. -Post a #bookshelfie. How do you arrange your bookshelves? Do you have cool memorabilia or framed photos? Do you have a special place for your own books or friends’ books? -What do you do when you’re not writing? If you’re comfortable doing so, share pictures from your life and of yourself. If people can connect to you, they’re more likely to follow you. I talked before about how showing people you’re a regular person is key, and that’s because it builds trust. You need to build trust if you want to build a loyal audience. Sure, people might come to your page, see a post about your book and think ‘That’s my favourite genre’ or ‘That cover is amazing’ and buy your book, but will they come back? Will they become an actual fan who cares about you, your life, and your career? -What are some fun, unique things about you? What defines your personality? Are you nerdy? Do you have a special skill other than writing? Do you have a knack for putting together stylish outfits? Do you travel as much as humanly possible? -How do you relax after a long day of writing? -How do you celebrate accomplishments? A meal out? A certain drink? A vacation? Do you have a reward system for number of words or chapters written, or for when you finish writing a book? Hopefully those prompts have given you inspiration and you have some ideas for photos you want to take. I usually take a couple of hours a week and dedicate them to photoshoots so I have a backlog of photos stored for when I’m busy or inspiration is lacking. Once you have photos ready to post, there’s something else important you need to keep in mind: hashtags. Hashtags are the best way for people to find your pictures and to grow your account. You can use up to 30 hashtags per post, and I recommend using all 30. -If you search those hashtags or other writing-related hashtags on Instagram, it’ll show similar hashtags along the top. That’s a great way to find hashtags to use in your posts. You can also check out some of your favourite authors’ Instagrams and see what hashtags they’re using to get some ideas. -Create a hashtag for your books or series. Just remember if you create a hashtag for one book, it can only be used for that book. Try to think big picture. You can also use your own name as a hashtag or create something that’s associated with your blog or brand. I recently created the hashtag #ramblingdaydreamer, and while I haven’t advertised it yet, I would love for it to be a community hashtag for creative people and/or travelers. If you’d like to use the hashtag, I’d be honoured. I’ll be checking it out regularly and will like and comment on your posts, plus share some of my favourites!